At Axon Optics, we’re big on science. You’ve probably read about it here on our website (if not, look here to learn more). To make a long story short, clinical studies have proven the value of our migraine glasses in filtering out offending light to lessen the effects of photophobia — not the least of which is migraine. We love science. It’s more than something to hang our hat on; it explains how our products work. But it’s not why we created them. We founded Axon Optics because the science helped us understand the difference our products could make in the day to day lives of users. It’s about reducing painful interruptions in your life and making it more livable. It’s about giving you the opportunity to go outside, shop, sit next to a window, or stay productive at work without being sidelined with a migraine. 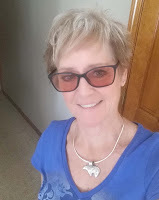 It’s about people like Celeste Cooper, and many others who’ve learned from real-world experience the difference Axon Optics eyewear can make in their ability to function on a daily basis. This is why we’d like to share a series of real stories from actual users who tried our glasses and offered up their experiences online. And if you have an Axon Optics story to share, we hope you’ll reach out and tell us about it, too. “…these glasses are not the same as sunglasses, which I have used to help my photophobia. Axon glasses are different; they are therapeutic. Celeste also appreciated the style of her glasses. You can get other frames, send in your own, and get the lenses in your prescription. The frames I got are the Axon Optics JURA migraine glasses for Migraine Relief and Light Sensitivity Relief. They are a stylish, classic, lightweight, unisex style spring frame, meaning they will hug your face without causing undue pressure. I must admit, the universal size scared me a bit at first, but the glasses fit my face with comfort. I hardly know [they’re] there. Wearing Axon lenses, Celeste reports reduced blepharospasm. She’s also able to attend conferences that support her efforts to advocate for people like her, without worrying about overhead lighting bringing on a migraine. Thank you, Celeste, for sharing your story with us! Has your own discomfort been reduced wearing our lenses? We want to hear your story. Please tell us about your experience so we can help others like you find relief. Haven’t tried Axon Optics migraine glasses yet? Shop for your own pair now.